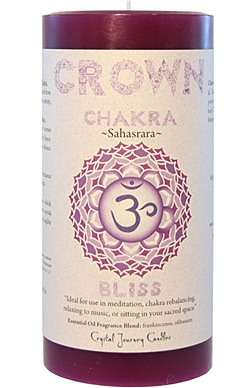 Crown Chakra - Crystal Journey Chakra Pillar Candle - 3" X 6"
Crystal Journey Chakra Pillar Candles are ideal for use in meditation, chakra rebalancing, relaxing to music, or sitting in your sacred space. When the time is right to visit your sacred space, Crystal Journey Candles help to enlighten the journey. Once you experience Crystal Jurney's candles, you will no longer believe that all candles are the same. There is no mystery behind the success of Crystal Journey Candles. They use the finest ingredients and offer a broad selection of scents. These Chakra candles are made from highly refined waxes so pure that they are considered food grade, wicks constructed from cotton and paper and essential oil blends. Soapstone Pillar Candle Tray - 4.5" & 6"